Fifteen-year-old Billy Hayman is the debut champion of the Australian Rookie Fest in Thredbo thanks to a sick run that included some stylish front and back 720s with a myriad of jib tricks to match. Next week the South America Rookie Fest in Valle Nevado, Chile, will take place as the last stop for the Southern Hemisphere of the World Rookie Tour 2010. Despite an unseasonal downpour of rain the day prior, Thredbo’s terrain park crew soldiered on to tirelessly put together a stellar looking slopestyle course. The set up included a 30 stair set complete with both round and flat bar options into a 6 metre box to cliff drop landing. Next was the jump line consisting of a 35ft jump into a 40 ft jump to finish. With the smooth take offs and landings, 540’s and 720’s quickly became the standard tricks of the top 5 riders in the finals. In the female rookie division Lauren Staveley’s combination of 50-50s with back and front 360s earned her the win. While in the grom division, Henry Bessell impressed with a winning run of 50-50 down the staircase into another 50-50 to backside 180 out off the cliff box, followed by a cab 540 into a backside 360. Billy, Henry and Lauren all secured themselves an all-inclusive entro to the Livigno World Rookie Fest in Italy and maybe the World Rookie Finals in Ischgl, Austria in the hope of securing the title of World Rookie Champion, an accolade once captured by Australia’s own Michaela Davis Meehan in 2009. 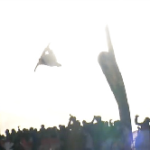 The prize includes registration, accommodation, meals and lift tickets, while Male and Female rookie winners also won a ride in the Red Bull stunt plane. The Australia Rookie Fest 2010 was made possible thanks to Red Bull, Thredbo, Smith Optics, Adrenalin Plus Boardstore, NSW Sport and Recreation, NSW Snowsport and World Snowboard Federation. Don’t miss the upcoming South America Rookie Fest, from the 13th to 23rd August in Valle Nevado, Chile. 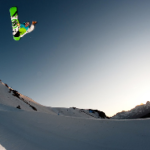 It will include a 2star slopestyle contest and a 7-day freeride film trip with Red Bull and Ride pro snowboarders. More info will be available in the next few days.